The Nets assigned Spencer Dinwiddie and Jared Dudley to their G League team in Long Island, Brian Lewis of the New York Post tweets. Dinwiddie (thumb) is expected to return tomorrow against the Hornets. The Hornets have assigned guard Dwayne Bacon to the Greensboro Swarm, general manager Mitch Kupchak announced. Bacon has appeared in 25 games with Charlotte this season, holding per-game averages of 4.4 points, 1.6 rebounds and 10.6 minutes. The Grizzlies assigned Jevon Carter to the Memphis Hustle, G League affiliate of the team, according to a tweet from the club’s PR department. Carter was drafted by Memphis with the No. 32 pick last June. The Hawks assigned guard Jordan Sibert to the Erie Bayhawks, the team announced in a press release. Sibert, 26, has yet to appear in a game with Atlanta this season. The Jazz have assigned center Tony Bradley to the Salt Lake Stars, announcing the news in a press release today. Bradley has seen action in 17 games with the Stars this season, scoring 13.6 points per contest. As they fight to hang onto the sixth seed in the Eastern Conference, the Nets will get some rotation reinforcements this week. According to Michael Scotto of The Athletic (via Twitter), head coach Kenny Atkinson said today that injured guard Spencer Dinwiddie is set to return to the court for Brooklyn on Friday. Dinwiddie, who last played for the Nets on January 23, underwent surgery a month ago to repair torn ligaments in his right thumb. At the time, the estimated timeline for his recovery was three to six weeks, so he’s ready to get back right in the middle of that window. Dinwiddie and veteran forward Jared Dudley were assigned to the Long Island Nets, Brooklyn’s G League affiliate, today in order to get some practice time in, tweets Brian Lewis of The New York Post. Both players are expected to suit up for the NBA club on Friday vs. Charlotte. While Danny Ainge acknowledged during a Toucher & Rich radio appearance on Thursday that “everybody has some fault” in the Celtics‘ struggles this year, the club’s president of basketball operations offered a strong defense of his head coach. “There’s blame to share for everybody, but I will say this: He’s the least, by far, of anybody that there is to blame,” Ainge said of Brad Stevens (link via Darren Hartwell of NBC Sports Boston). Knicks fans – including Spike Lee – may be happy to see the team embrace the tank and improve their draft lottery position, but losing games isn’t head coach David Fizdale‘s goal the rest of the way, as Steve Popper of Newsday writes. “I’m lucky because Steve [Mills] and Scott [Perry] and Mr. [James] Dolan have all said to me, you play every game to win and you don’t worry about where we land in the draft and all of that stuff,” Fizdale said. Although the Sixers are missing a couple big men and have Justin Patton for Thursday’s game, the young center probably won’t play, head coach Brett Brown told reporters today (video link via Keith Pompey of The Philadelphia Inquirer). We had more on Patton and the 76ers in an earlier round-up. After Kemba Walker‘s explosive 60-point performance Saturday against the 76ers, Rick Bonnell of The Charlotte Observer argues that the Hornets shouldn’t overthink things, and should offer Walker the maximum allowable contract this summer. Walker will be an unrestricted free agent as he enters his age-29 season, and Bonnell makes a case for the importance of keeping the point guard around, despite the team’s struggles in recent years. Walker is having a career season, averaging 28.7 points and 6.1 assists per game, and is certainly capable of taking over any game with his scoring ability. Walker would certainly be expensive — his full, five-year max projects to be worth $189MM+, unless he makes an All-NBA team this season, in which the deal could be worth up to $221MM. However, Hornets owner Michael Jordan has shown that he isn’t afraid to spend to keep players in Charlotte, and Bonnell argues that this instance should be no exception for the team’s leader. After the Nets defeated the Wizards on Friday, former Wizard Jared Dudley suggested that the team is in need of a shake up, according to Ben Standig of NBC Sports Washington. Much of the Wizards’ core that played with Dudley in 2016 is still on the roster, but the team hasn’t had consistent success in several years. Goran Dragic may be out for an extended period due to a right knee issue, according to Ira Winderman of The Sun Sentinel. The Heat are still without Dion Waiters and could use Dragic’s scoring and playmaking abilities as they look to bounce back from a slow start. Barry Jackson of the Miami Herald hits on several Heat-related topics, including the conditioning of James Johnson and Waiters and the lack of interest from the team as it relates to adding Carmelo Anthony to the rotation. Unless Kyrie Irving has a change of heart about staying in Boston, the Knicks won’t have a shot at signing the Celtics’ starting point guard. They might have a chance at Boston’s other talent point man, Marc Berman of New York Post speculates. Terry Rozier would be a good fit for them, since they’re still trying to choose among Frank Ntilikina, Emmanuel Mudiay and Trey Burke. Ntilikina, Noah Vonleh, Allonzo Trier and Damyean Dotson are some of the young players New York could dangle as trade bait for Rozier, Berman opines. Rozier will be a restricted free agent in July. Veteran forward Jared Dudley has been a pleasant surprise on and off the court for the Nets, Chris Milholen of Nets Daily writes. 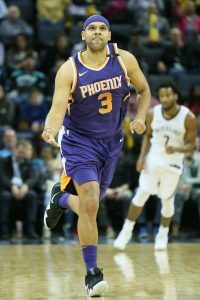 Dudley, acquired from the Suns in an offseason deal, has posted modest numbers but he’s started every game and he’s served as a mentor to the team’s younger players. “He’s doing it in the locker room and he’s also doing it with his play, because he doesn’t need the ball in his hands,” coach Kenny Atkinson said. Dudley’s $9.53MM salary comes off the books at the end of the season. Sixers forward Wilson Chandler will remain on a minutes restriction as he works his way back from a hamstring injury, Sarah Todd of the Philadelphia Inquirer reports. Chandler will play approximately 15 minutes until coach Brett Brown is satisfied that he can handle a back-to-back situation. “I think the minute restriction won’t be long, a couple weeks or so, it’s not long term, I’m not worried about that at all,” Chandler told Todd. The Knicks’ trio of president Steve Mills, GM Scott Perry and coach David Fizdale have put a plan into action designed for the long-term health of the franchise, Jeff Zillgitt of USA Today writes. They are focused on player development and building through the draft rather than the quick-fix solution that have dragged down the franchise for so long. Frank Ntilikina scored a career-high 17 points Friday in his first NBA start at point guard, leaving the Knicks with some decisions to make, writes Marc Berman of The New York Post. New coach David Fizdale adjusted his lineup, replacing Trey Burke with Ntilikina and starting rookie Mitchell Robinson along with Noah Vonleh up front and Damyean Dotson at the wing. Burke started the season’s first five games, but prompted the change with a 1-for-10 shooting night Wednesday. The point guard picture should become more crowded next week when Emmanuel Mudiay is expected to make his season debut after recovering from a sprained ankle. Berman suggests that the Knicks may be realizing that they won’t get a top point guard in free agency and are revisiting the idea of developing Ntilikina at that position. Enes Kanter doesn’t seem to be on board with the Knicks‘ new lineup, Berman adds in a separate story. Kanter is normally talkative with the media, but he didn’t have much to say after losing his starting job Friday. It marked Kanter’s first appearance in a reserve role since being traded to New York before the start of last season. “Coach said he wants me to lead the second unit,” he told reporters. “I’m just leading the second unit.’’ Kanter had a chance to leave the Knicks over the summer, but elected to opt in for the final year of his contract. The Knicks will have to adjust their lineup to compensate for the loss of first-round pick Kevin Knox, writes Marc Berman of The New York Post. Knox went down with an ankle sprain in Saturday’s game and will miss at least two weeks. He will stay behind for rehab work as the team embarks on its upcoming road trip, and his condition will be re-evaluated in another week. Guard Damyean Dotson took Knox’s rotation spot after the injury, but coach David Fizdale has other options. He played centers Mitchell Robinson and Enes Kanter together at one point and could also give more minutes to Mario Hezonja. Courtney Lee‘s physical condition continues to be a concern, Berman adds in the same story. Tests are scheduled today to determine the cause of the neck pain he has been experiencing, which has now expanded to his chest. Lee has been dealing with the condition since getting fouled early in training camp. The Knicks reportedly would like to trade Lee, but they need him to get back on the court first. Jared Dudley was expected to bring a veteran presence when the Nets acquired him this summer, but he has been surprised to find himself in the starting lineup, relays Ben Stinar of AmicoHoops. Dudley didn’t play much with the Suns the past two years, but Atkinson has been using him with the starters while Hollis-Jefferson is out. “Obviously, two years with limited playing time in Phoenix, to get out there and dust the cobwebs off, and something that felt good,” he said. The Knicks have given offseason addition Mario Hezonja the green light to shoot more, an opportunity the 2015 lottery pick didn’t exactly have throughout three seasons in Orlando. According to Greg Joyce of the New York Post, head coach David Fizdale plans to “hammer” the swingman about shooting more threes and wishes that he’d be greedier with the ball. Hezonja understands that he’ll be shouldering some of the offensive load, especially as a potential starter, but wants to make a point of serving as a playmaker for his teammates. The Raptors have plenty of depth on the wing which could limit the opportunities that C.J. Miles gets to bounce back after a disappointing 2017/18 season. Eric Koreen of The Athletic writes about Miles’ defensive struggles last season and the competition he’ll be up against to get significant minutes this season. The Nets will pay Jared Dudley $9.5MM this season but the 33-year-old could be more than just an expiring contract. Brian Lewis of the New York Post writes about Dudley’s defensive IQ and ability to provide leadership in the locker room as major assets. The slimmed down veteran could also earn minutes as the lone stretch four on the roster. Nets first-rounder Dzanan Musa has been bulking up since the draft in hopes of being physically prepared for the NBA, relays NetsDaily. In a weekend interview with with Radiosarajevo in Bosnia, Musa said he has been focused on “physical progress” and has gained 15 pounds this summer. The 29th overall selection has spent most of the summer at the Nets’ training facility, but recently returned home to Bosnia to participate in a pair of FIBA World Cup qualifying games. Trade restrictions on the Nets‘ Jared Dudley will expire September 20, according to a separate story on NetsDaily outlining important upcoming dates for the team. That date will mark the two-month anniversary of the trade that sent Dudley from Phoenix to Brooklyn, and it will lift the restriction that he can only be dealt in one-for-one trades. The Knicks picked up a pair of promising young players on one-year deals while preserving their cap space for next summer, writes Jesse Blancarte of Basketball Insiders in the season preview for New York. The Knicks signed Mario Hezonja for $6.5MM and Noah Vonleh for a non-guaranteed $1.6MM, giving them a year to see how much they can contribute before making long-term decisions. Blancarte also believes David Fizdale was the right choice to take over as coach. Jabari Bird is under guarded watch at a Boston-area hospital following his arrest Friday on a “domestic incident,” tweets A. Sherrod Blakely of NBC Sports Boston. Bird is expected to be released from the hospital today or tomorrow and will be officially charged for his role in the incident. The Raptors have scheduled a press conference for September 21 to introduce Kawhi Leonard and Danny Green, according to Josh Lewenberg of TSN Sports (Twitter link). Both were acquired from the Spurs in a mid-July trade. After playing for four teams in eight seasons, newly signed Nets forward Ed Davis feels like he has found a place where he’s wanted, relays Brian Lewis of The New York Post. Brooklyn was quick to pounce on Davis, offering a one-year, $4.4MM deal minutes after free agency opened. Davis topped all NBA reserves in rebounding last season with 575, but the Trail Blazers decided he was expendable. Portland executive Neil Olshey told reporters he was on the phone when Davis when he received the Nets’ offer and advised him to accept it. He may be considered a throw-in from the Kawhi Leonard trade, but Danny Green is exactly the type of player the Raptors need, according to Steven Loung of SportsNet. Green will solve some of the team’s spacing issues with his 3-point accuracy, and he’s an excellent defender to match up against opposing wing players. The Celtics were able to save some money by trading Abdel Nader to the Thunder instead of waiving him, Bobby Marks notes on ESPN Now. The move saves Boston about $675K in tax penalties and another $450K in salary. Getting rid of Nader leaves the Celtics with 14 guaranteed contracts and a tax bill of $3.8MM if they waive Rodney Purvis, whose $1,378,242 salary doesn’t become guaranteed until January 10. 2:16pm: The Nets and Suns have officially completed their trade, according to a press release issued by the Nets. Dudley, who told Scott Bordow of The Arizona Republic (Twitter link) that he’s not a fan of buyouts, expects to play for Brooklyn. Wojnarowski suggests the Nets may envision Dudley as a stretch four in their lineup. 9:16am: The Nets and Suns have agreed to a trade that will send Jared Dudley to Brooklyn and Darrell Arthur to Phoenix, league sources tell ESPN’s Adrian Wojnarowski (Twitter link). The Nets will acquire a top-35 protected 2021 second-round pick in the deal, according to Wojnarowski. The deal appears to be financially motivated, with Wojnarowski indicating that Arthur and his $7.46MM expiring salary will likely be bought out by the Suns. Dudley, who is on a $9.53MM expiring contract, could have a similar conversation with the Nets, Woj adds. The savings in the trade are minimal for the Suns, but it’s possible they have another move or two up their sleeves. According to Basketball Insiders’ salary data, Phoenix will have a team salary of $98.63MM after the deal, which is good for $3MM+ in cap room. According to John Gambadoro of 98.7 Arizona Sports (Twitter link), the Suns had been trying to buy out Dudley for the last couple weeks. Arthur is a little cheaper and it’s possible he’ll be more amenable to a buyout. As for the Nets, they remain in asset-collection mode after having acquired a pair of draft picks from the Nuggets in a salary-dump deal that included Arthur earlier this month. Today’s move will ensure that Brooklyn once again has a second-round pick in the 2021 draft — the club traded its own ’21 second-rounder in the Dwight Howard deal with Charlotte.